Currently, we are in our social issues unit in reading workshop (one of my favorite units!) and students are in book clubs. 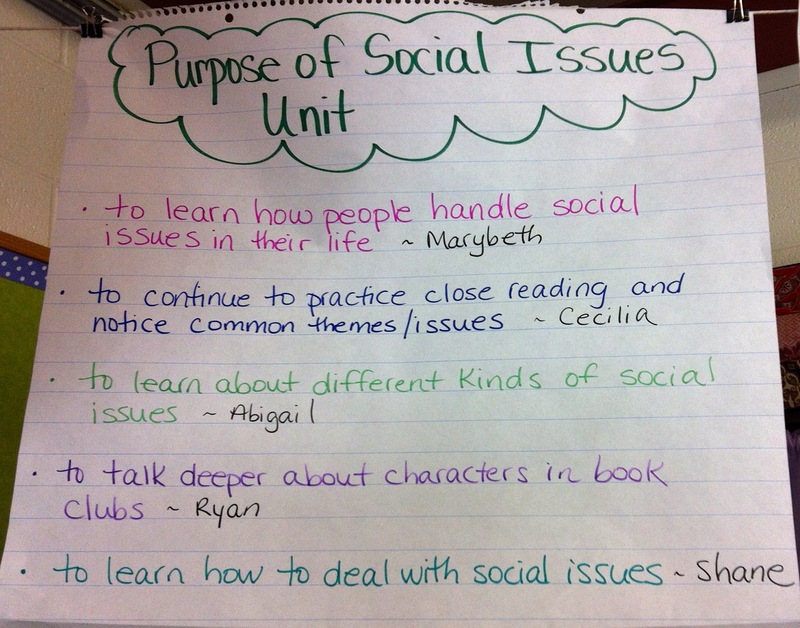 Last week, to launch the unit, we discussed the purpose of the social issues unit and students brainstormed why they think we have a social issues unit. As students shared their ideas and opinions about the purpose, I jotted them down on the chart below. I always launch units by having this type of conversation with the students because I believe it is so important for students to know and understand the WHY behind our units and lessons. 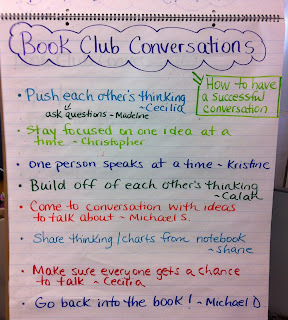 This is our first book club unit of the year so we also brainstormed and discussed the purpose of book clubs. Students have been participating in book clubs since 3rd grade so they come to 5th grade with book club experience. 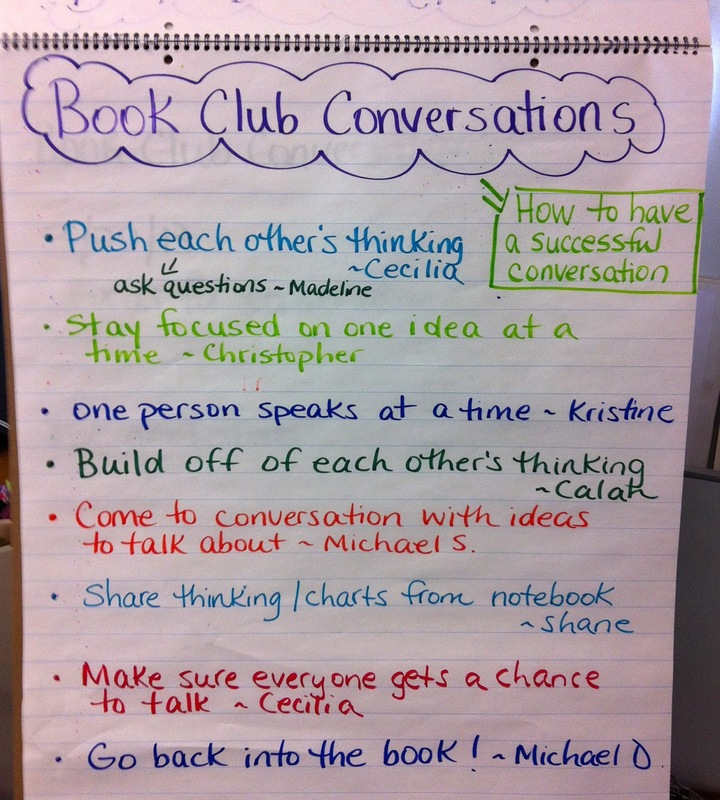 Below is a chart we created as a class to list students' ideas about preparing for and having a successful book club conversation. 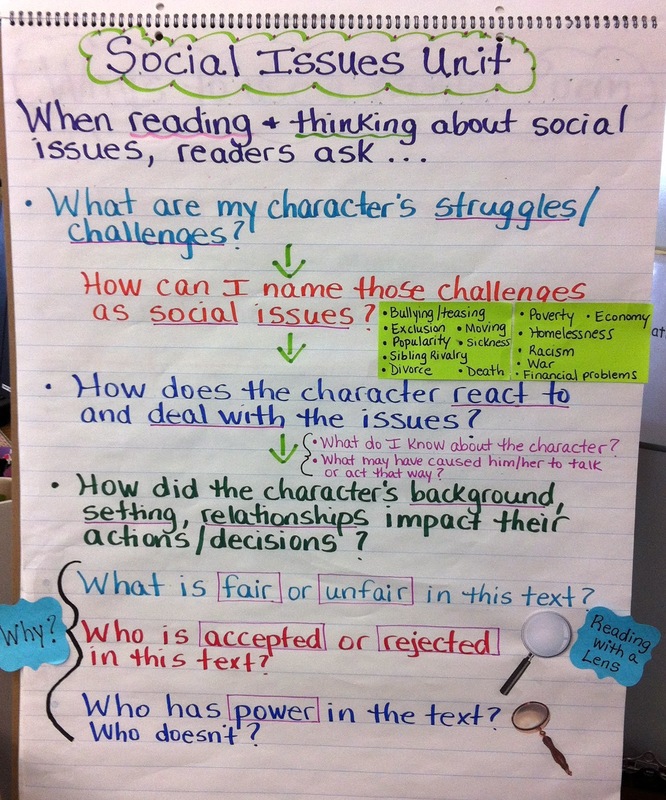 So far in the unit, we have been learning how to use specific lenses to deepen our thinking about the social issues our characters are dealing with in our books. For example, reading with the lens of fairness - what is fair or unfair in this text? Or reading with the lens of acceptance - who is accepted or rejected in this text and why? Or reading with the lens of power - who has power and who doesn't? Whose voice is being heard and whose isn't? Below is a chart listing our mini-lesson teaching points so far for this unit. Students have been applying these teaching points in the social issue books they have chosen to read with their book clubs and we are also applying them as a class in our read alouds. I like the way you are preparing students to gain the most learning from the book clubs, Melanie. I also like the use of lens. It's the same, but I usually use point of view, and I like the word "lens", will try it out next time I facilitate a group. This is interesting work! Will you review the charts often? Can't wait to see what books you're reading! The kids really understand the word "lens" at this level and it helps them as reader to deepen their thinking. I hang up my charts for the current unit on a clothesline that is above our minilesson area so we refer to them throughout the unit. I also take pictures of our charts and share them with the whole class on Google Drive so they can access the teaching points and strategies from home too. I, too, like how you've used the lens concept with 5th graders. It makes me think I should connect with feeder elementary and middle teachers and tap into the language they've used. 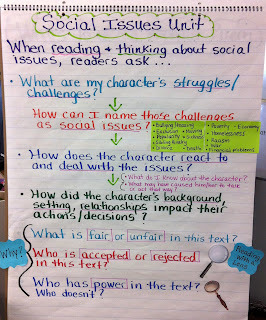 In my classroom we read from a critical lens--connecting to that idea sooner sure makes sense. Thank you for posting your charts. We are working hard in my room to have whole class conversations that don't depend on me asking the next question. The kids are getting better and better at it. I think it's time for me to revisit a similar chart we made at the beginning of the year. I, too, take pictures of charts, but I never thought about putting them on Google Drive for the kids to access. I'm glad you mentioned your titles in your response to Linda...I was wondering what you were reading. Hi Julie, So glad to hear that the photos of charts are helpful! In addition to the books students chose to read in their book clubs, we are also referring to our chapter book read alouds we have read so far this year since they all had social issues: Drums, Girls, and Dangerous Pie; Out of My Mind; The Running Dream; One for the Murphys, and Bystander. March Madness Book Edition: Our Elite Eight! March Madness Book Edition: Our Sweet Sixteen! #Slice 2013: 8 of 31- What's Left? #Slice 2013: 7 of 31- Passion in Schools?